Based on the popular V-Strom 650, which has been the best-selling mid-capacity dual-purpose motorcycle over the last decade, the new XT version boasts lightweight DID wire spoke rims, designed to improve performance on unpaved roads, while a new beak takes design cues from the V-Strom 1000 and iconic DR Big and improves airflow to the radiator. Hand guards, aluminium sump protector and engine bars complete the look and add to the V-Strom 650XT's rugged presence. Suzuki GB Marketing Manager Rob Cooper commented,"The XT version of the popular V-Strom 650 builds on the original bike's proven platform as a comfortable and capable adventure-tourer, but adds new levels of practicality with the wire wheels and other added extras, helping maintain the V-Strom's position as the best dual-purpose machine in this sector of the market." The V-Strom 650XT is available in authorised Suzuki dealers now with an RRP of £7,499. Additional accessories, including aluminium luggage and Vario touring screen, are also available. 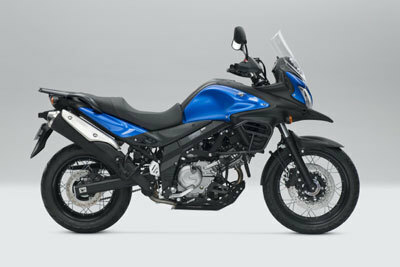 For more information, visit suzuki-gb.co.uk.